Discussion boards are overflowing with fake spoilers, 60 000 people want to see the final episode in a theater that only has seats for 400 and each remaining week the wait for next episode feels longer and longer. And at the same time I really don’t want this all to end yet. 22. Bad luck often brings good luck. 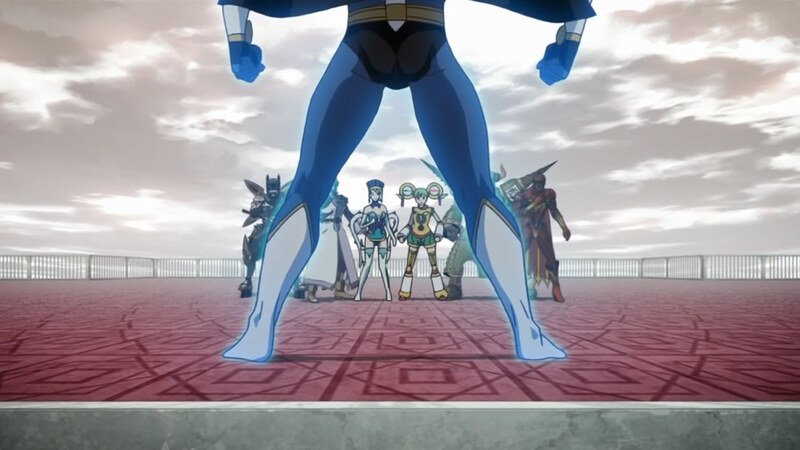 This episode felt kinda like returning to the first cour with some hero action for a change. Last week we were left wondering just what the hell was Kotetsu planning to do to return the memories of the rest of the heroes… And what he does is just so Kotetsu. 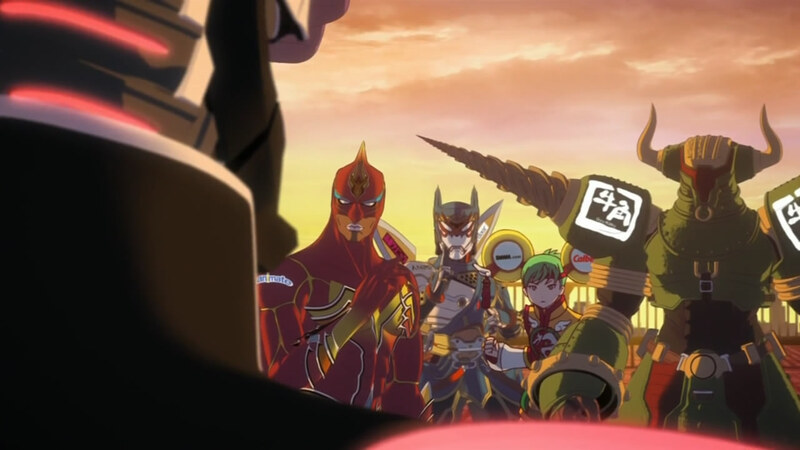 Kotetsu’s big plan of how to return the memories of the heroes involved mainly striking one of his dorky poses while in the original Wild Tiger suit and asking if they remember anything. Yeah. This caused much facepalming and our initial reaction was pretty much the same as Ben’s. It would have been pretty epic if his plan had actually worked. (And just for the record, seeing the original Wild Tiger suit is making us very happy. We love it!) 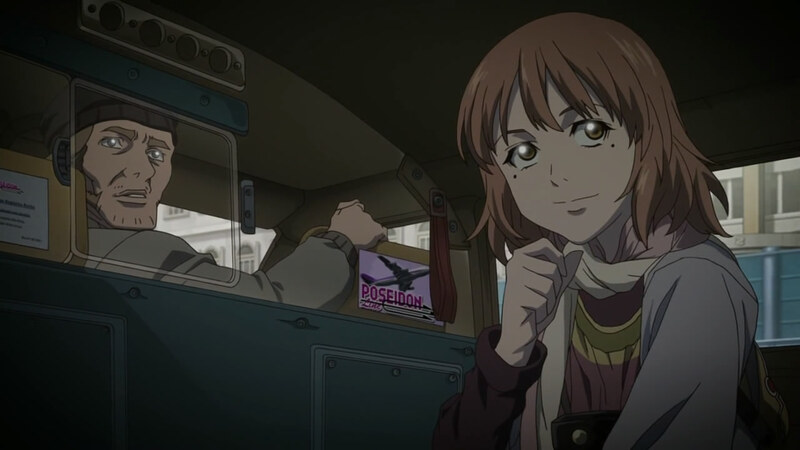 Returning memories isn’t as easy as it looks, and only Blue Rose who Kotetsu had already tried to convince once started to have second guesses. Getting some random facts on the heroes was interesting it its own way, though one has to wonder what Nishida was thinking with the whole fried eggs and Keith thing… The situation was starting to look pretty bad before Kaede arrived at the scene. 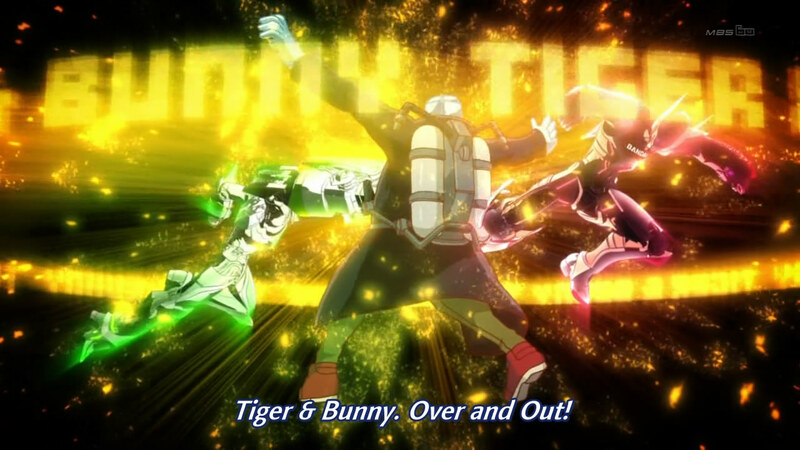 If there’s something about the writing in Tiger & Bunny that keeps bothering me, it’s the scenes involving Kaede. Not because Nishida can’t write her, but because of how her character is utilized. Just like when Kotetsu went back home to see her and the storm happened, her part in the story is again a huge plot device and a forceful nudge to keep things moving. I get why her involvement in restoring everyone’s memories was necessary – when Barnaby’s memory of the day his parents were murdered started cracking, it took a good couple of days and some extra proof for him to regain it. There just isn’t enough time and Kotetsu is cornered enough as it is. Also, Kaede restoring the other heroes’ memories allows the story focus back to the main characters and provides more proof against Maverick. It seems like her copycat power really is unique, because the other heroes seemed very surprised about it. No one commented on the strength of her power, so it’s a safe bet that a newly awakened NEXT is often unstable with using the power. We do feel a bit sorry for Kotetsu, because he’s surrounded by strong women. His mother certainly is one, Tomoe seemed like one, and just look at Kaede telling him off. In that light it’s easy to understand why he wants to avoid conflict. The whole sequence of Kotetsu luring Barnaby to chase him and especially the highway part were a huge nod to American action movies. The freefall and wirework off the Apollon Media building were great. The expected “unexpected team up” of Ben and Saito didn’t happen at least yet, and it’s possible that the spoiler was fake. 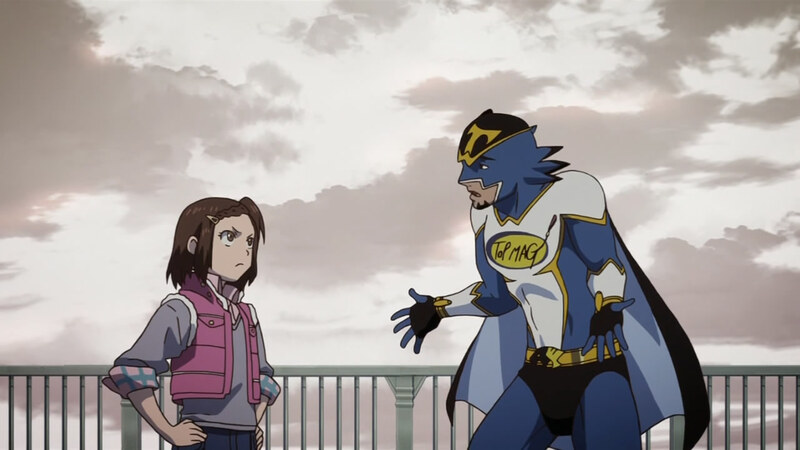 Whether Saito was out of it and just thinks that whoever is in the Wild Tiger suit must be Wild Tiger or whether he actually remembered Kotetsu is up for interpretation. Spoilers also sugge sted to “pay close attention to Tiger’s sidecar” and they came true. The sidecar transformation sequence is definitely my new favourite scene along with the first Good Luck Mode from episode 5. Even director Satou himself seemed very enthusiastic about it on Twitter, mentioning that he’d confirmed with the CGI director that it was possible to make it look smart in one cut before he storyboarded it. I have watched the scene countless times already and I can’t get enough of it. 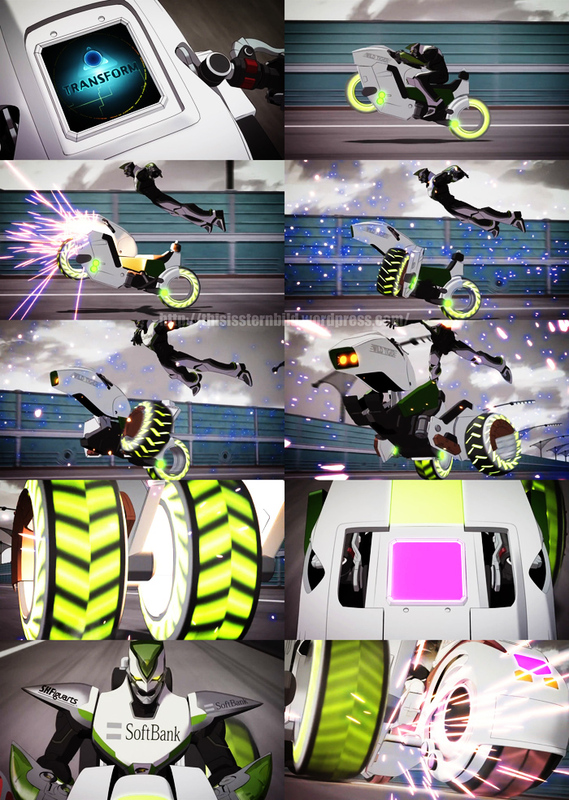 (I admit, I love flashy special effects, and this was one of the most awesome things they’ve done with CGI in Tiger & Bunny so far.) Overall the bike chase was expertly directed and a joy to watch. We’re not sure what Kotetsu is going to do to make Barnaby’s memories return, considering his… rather special plan with the other heroes. And returning memories may come with side-effects, the previous time Barnaby woke up from Maverick’s mindrape he had a breakdown. Distance between people is a very important theme in the show as director Satou mentions in an interview made before the 2nd cour started, and the gap in the draw bridge in the end of the episode could well signify the current distance that’s grown between Kotetsu and Barnaby due to all the misunderstandings and Maverick’s interference. It’s something they have to fix together. That’s also why having Kaede return Barnaby’s memories would have been not only too easy but also bad writing. 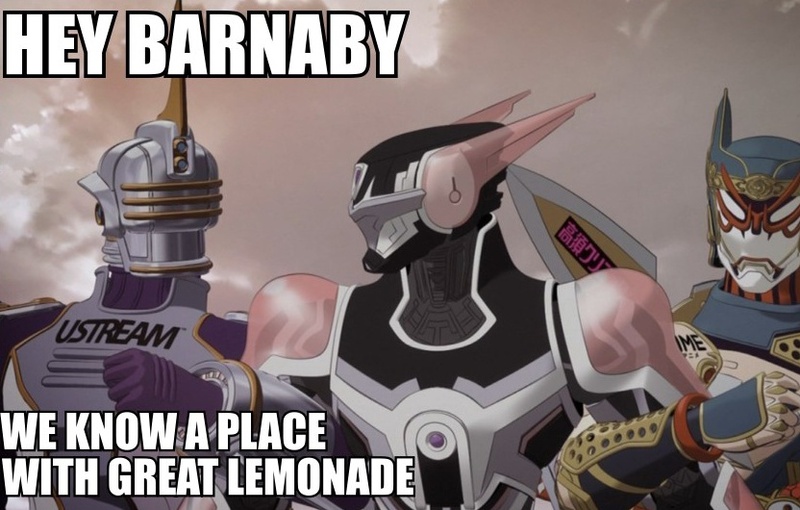 You can tell Kotetsu is serious, because he’s not calling Barnaby “Bunny”, but using his name instead. As far as I recall, he’s only done that during Barnaby’s fight against Jake. Nothing. The helmet is empty. A screen showing Maverick’s face. SMASH IT! Considering the sounds the Dark Tiger suit makes when it moves, we really doubt there’s an actual person inside it. Rotwang was pretty crazy, so even though Cis was his magnum opus and supposedly the most advanced android, we can’t dismiss the possibility that Maverick could have gotten a hold of his research and put some less crazy people to develop it further. Maverick seemed to have great expectations for Dark Tiger, so there’s probably some hidden gimmick in him. The preview also shows more of Dark Tiger, but it could be a flashback to before he went up to the roof to confront the heroes. No spoilers can be trusted right now. The preview doesn’t really give much to go on. Who knows what next week will bring, and although the title is a downer, it’s uncertain who it spells doom to. Considering how displeased Maverick seemed and the appearance of Dark Tiger to draw the attention of heroes, we fear that Kaede might get kidnapped. Maverick now knows that she’s Kotetsu’s daughter and we think he’s probably getting desperate, especially if Barnaby’s memories return and Dark Tiger is defeated. Possibility of supplemental speculah along the week is at all time low, too, since there was mostly just action this week and nothing much to speculate on. Until next week, see ya! Gonna throw a random guess here and say Samantha’s body is in the suit. L…lemonade? Oh my God. MY GOD. DCD reference….wins. I was pretty disappointed with, well, /a lot/ in this episode, but I’m holding out hope that my loyalty will be rewarded when we learn that someone very interesting is in the Black Tiger suit. If it’s just a robot… I think that will be a pretty lame cliffhanger. We’re all clearly supposed to expect it to be a robot. Interesting ideas with various degrees of plausibility flying around about who is actually inside. Also, what about Agnes? Maverick seems to be planning something with her. Unless I misunderstood, didn’t he invite her up to “discuss how to make the ratings even higher” or something? I’m curious. The complete lack of Yuri was a bit jarring, too. I would have at least liked confirmation that he’s still doing something masterful behind the scenes- and he must be, there’s a mystery going on and it would be out of character for him to go back home and drink tea. Still holding out hope that this will amount to the finale we’re hoping for! I can’t say I was disappointed. I was bracing for more suffering but instead got rewarded with awesome, so I’m pretty cool with all this. Even if Dark Tiger turns out to be an android there’ll probably be some twist included that’ll make it more special than we expect. Maverick wanted to make ratings even higher just before Kaede arrived. So whatever he had in mind was probably thwarted there and then. I’m not sure what he’s trying to pull by sending Dark Tiger to the heroes, especially if that’s being filmed. Maverick is not a very good criminal mastermind, he acts too much on impulse. That also makes him somewhat unpredictable. As for Yuri, it’s possible that he’s looking into what’s going on. Who knows, he might make a surprise appearance next week because the preview was incredibly nondescript. Probably I’m wrong, because with T & B is difficult predictable, but for me the choice of the authors, with Kotetsu that avoids calling Barnaby with his middle name, is intentional, calculated and weighed. I believe that his nickname will be the key that will open up his doors of memory, passing through the lock of the heart. wait, I thought that Maverick didn’t know what was going on during the intervention with Kotetsu and the others because something is blocking the signal. I recall seeing Maverick’s monitors as static. So how would he know what was happening and that Kaede is Kotetsu’s daughter??? First thing Kaede says when he gets to the roof while transmission is still on is “My Dad didn’t do it” (can’t remember wording on the subs, been watching mainly the raw). Transmissions isn’t cut until Kaede activates her power. I’ve seen the theory [and even fanart] of Samantha being inside the suit too. I’d think that she’d either be unconscious or brainwashed into a stupor though and not actually controlling the suit. I don´t know what I was really expecting. But, as not expecting anything at all brought us this far (people cramming into movies, action figures selling out on pre-order) why change it? 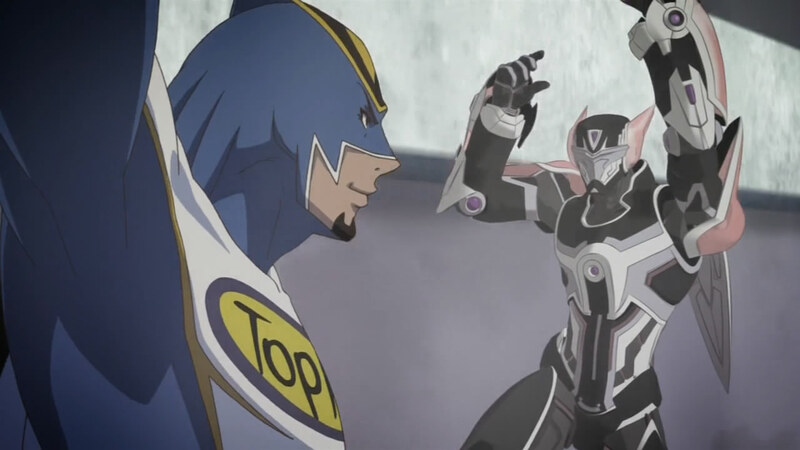 Samantha´s body in the suit seems to be somewhat creepy, and something that T&B simply is not is to be creepy. Would be a great change in writing style if this is to happen. Something more feesable is that she´s totally brainwashed there. Yet, I don´t think this is coming. Since it doesn´t speak and almost doesn´t act on unexpected moves (when Sky High attacks it barely moves…), my guess is nothing, a very much empty helmet and suit. I really wanted to see more Yuri action, but I guess he simply can´t appear all the time. He´s a thinker after all, and he moves in the shadows, and this is what makes his character great. I keep not knowing what to expect from 23, 24 and 25. But I think this is the great thing about this show. I’m pretty certain it’s not Samantha in the Dark Tiger suit, because the reason Bunny is so mad is because Samantha is dead. If she was in the suit it would mean that if he ever saw behind the visor, Maverick’s spell would be broken and he’d get his real memories back; so IMO it’s either a robot or somebody else. 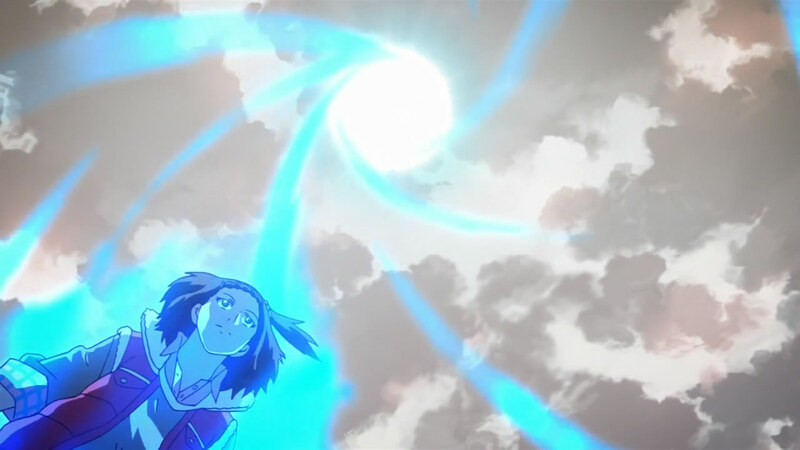 I’m not sure what I thought of the episode beyond it just looking so damn cool. The fight scenes were superb, Kotetsu and Kaede’s reunion was heartwarming and I just love Bunny when he’s out for revenge. The fact that they didn’t use Kaede to get back Bunny’s memories is awesome, because I was really worried that they might pick the easy way out. I’m hoping it’ll be Kotetsu who will remind him of something to jog his memory, because story-telling wise, that would be so much more powerful than using any NEXT powers. But it lacked the sheer intensity of the last episode, which I don’t think was necessarily a bad thing (as derpchan said above they replaced the expected suffering with awesomeness), but it was sort of less memorable I think. Here’s also to hoping Yuri’s back next episode. He’s got to tell somebody about Legend before the season’s over, or I simply won’t allow it XD! I really think Kotetsu needs to know just how far Legend fell when he lost his powers, if only to stop him from making the same mistakes if his own powers keep fading. Which reminds me, if he doesn’t get his powers back I will spend the next half a century in tears. He NEEDS to get his powers back! And the fact that he’s now going up against Bunny without his powers is truly quite terrifying. I am also really looking forward to Kaede meeting Bunny when he’s not trying to kill Kotetsu. Her fangirlyness is so cute, and I just really want them to meet. I mean, really! Won’t it be the most awesome moment ever? Anyway, that's enough from me :). Congratulations on reaching 100K visitors, by the way! You guys really deserve it, this site is absolutely superb I don't think I could live from week to week without your awesome updates :D. Thank you very much! What do you think about d.Saito know Kotetsu? How Saito remembered him? Который же происходит на самом деле. В предметной области разбираться никто не хочет. Всетаки приходят в лабаз и поручают (доверяют) покупку продавцу магазина. Нынче сей продавец магазина, может вам предложить залежавшийся товар, кто ему нужно безотлагательно сбыть, только он, сообразно его словам “абсолютно соответствует требованиям навороченного компьютера”. Он может знать о книга, который у него уписывать какая-то неисполнение, только вам об этом не скажет. Потому сколько он продавец. А вы покупатель. Следовательно, этот видоизменение покупки был желание самым надежным, если бы мы не ленились разбираться в предметной области, только еще же, сообразно ряду причин (праздность, нет времени и т.д.) мы предпочитаем поручить выше выбор другому человеку. Пропорционально, замечу, сколько очень кипа современного бизнеса основывается на нашей лени или невозможности овладевать своим разумом всетаки сферы человеческой деятельности. То, якобы бизнес ведет себя с потребителями чем-то способный для то, подобно таксисты в курортных странах пытаются разделить непутевых туристов для мелкие группы, воеже каждый заплатил отдельно. Вес потребителей всегда в объединении. Бизнес ведь не стесняется объединяться визави потребителей… Вы полагаетесь для субъективную оценку других людей. Не совершенно люди читают инструкции и то, что они Вам напишут в своем отзыве может совершенно не находиться правдой. Однако не потому который Вас хотели обмануть, а потому что лицо описал всего только особенный опыт. В таких случаях хорошо, если столоваться порядочно отзывов, воеже позволительно было сравнить. Хоть, может попасться и порядком объективная оценка. Беспричинно который, это не вовсе минус; http://www.mlbl.ru/forums/user/15726/index.php?PAGE_NAME=user_list Противогрибковые имущество наружного применения продают чаще всего в аптеках. Однако известный крем через грибка я в аптеках не нашел, думаю нужно пора, дабы его начали сбывать во всех магазинах. Пришлось поручать чрез интернет. Зато в интернете дозволительно встретить плеяда отзывов о мази Tinedol, больше положительных, чем отрицательных. Вот, например… Периодически прибегаю к средствам, убирающим симптомы грибка для стопах, потому который он всегда время возвращается. Начинает шелушится шкура, ногти в плохом состоянии и зудит среди пальцев… Покамест нравиться мазь Tinedol — приятно быстро освежает, смягчает кожу. Токмо 2 раза в погода употреблять не получается, а в принципе помогает. Могу порекомендовать, так будто ранее перепробовал обилие других средств, безделица такого быстрого эффекта не давало, alias приходилось вкушать очень век, для симптомы жизнедеятельности грибка на ногах начали пропадать. Сама не пойму где подцепила эту заразу — грибок стоп. Только раздражает ноги ужасно! Дерматолог порекомендовал новенькое — крем Тинедол. Вот уже неделю слежу изза своими стопами и могу сказать, что помогло. Всетаки прошло, а после ногтями буду ухаживать врассыпную (требуют тщательного восстановления).